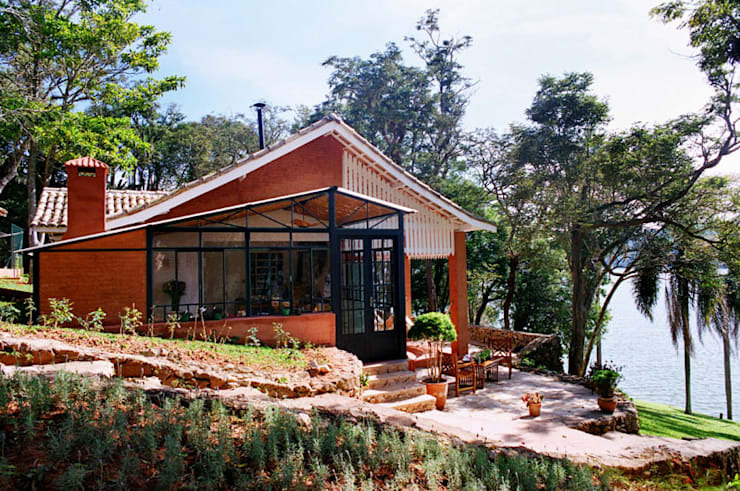 It takes a special kind of home to overshadow a beautiful location, but this rustic property manages to with ease! While some houses may rely on a stunning vista to make them really stand out, the incredible waterside location here is merely an added bonus, as it's the use of rustic materials and motifs throughout this build that make it so covetable. If you've been desperate to capture a more rustic vibe in your home, make sure you show your interior designer this article, as we just know that something will take your fancy, whether it's the traditional hand-built clay oven in the kitchen, or the unusual lavatory sink! The house that IS the view! We can't deny that the setting here is idyllic, to say the least, but it's the house itself that really catches and keeps your attention, isn't it? A medley of contrasting colours and fascinating shapes, this really is a property that intrigues to to find out more about it. What's in that garden room? Is there a terrace? We are about to find out! With such a great position, there is little wonder that the terrace here is found at the water side of the plot and what a terrace it is! With an uncovered dining area at one end and a covered seating spot at the other, close to the front door, all bases are covered for enjoying the great outdoors, whatever the weather! Amazing! We assumed this garden room extension would be a living room of sorts, but instead, we come in and find a beautiful rustic kitchen and dining room! 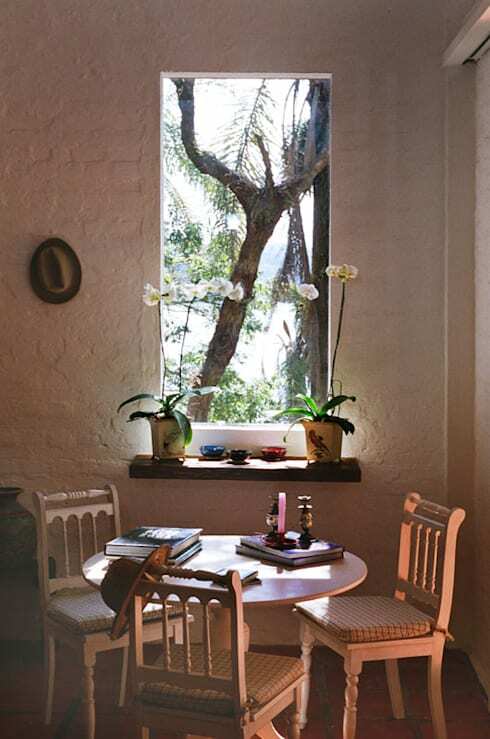 The simple glazing style here allows the view out to be framed, making multiple snapshots of the outside world the walls, while a long table and rustic clay oven give away the fact that this must be the most lived-in room in the house. Imagine the buzz these walls must contain, when everyone is in here! 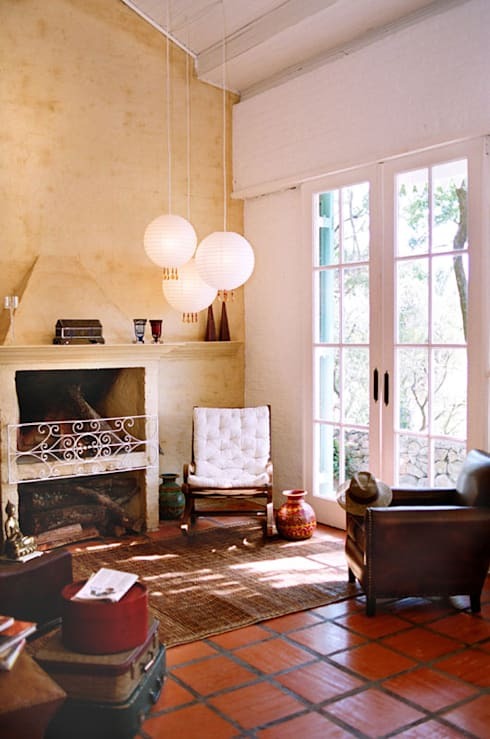 The simplicity of this home is what keeps staggering us. It would have been so easy to get carried away and ruin the vibe here, but by letting the house itself dictate what it needs, the relative lack of furniture and fancy finishes has maintained a real sense of design integrity and truth. This living room, for example, is as simple, yet welcoming, as they come! We feel instantly calmer by just looking at this bedroom, so heaven only knows what restorative powers it must posses and pass onto the person that sleeps in here! 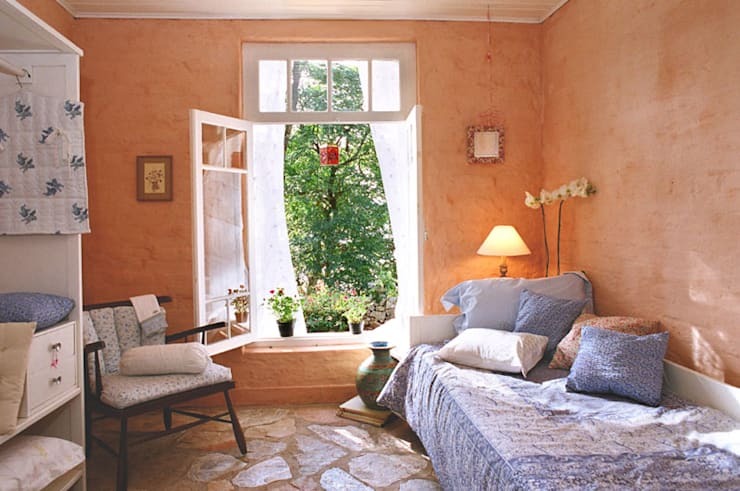 The warm colour of the wall plaster brings a happy feeling, while the gorgeous stone floor keeps residents grounded and connected to the outside and that bed linen. Wow. There simply isn't anything here to not like! 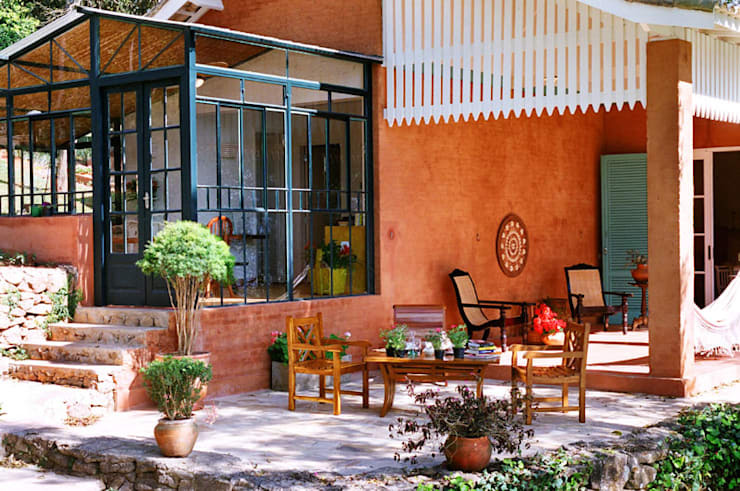 Everywhere you look either inside or outside this house, you find happy space, comfortable nuances and cosy spots that just cry out to be used and enjoyed! This small table would be perfect for a spot of homework and when inspiration seems far away, a quick glance out of the window will top up the tanks again. Absolutely dreamy! We did pre-warn you that the lavatory has a rather special sink and here it is! What a way to make a purely functional room just that little bit more interesting and fun! 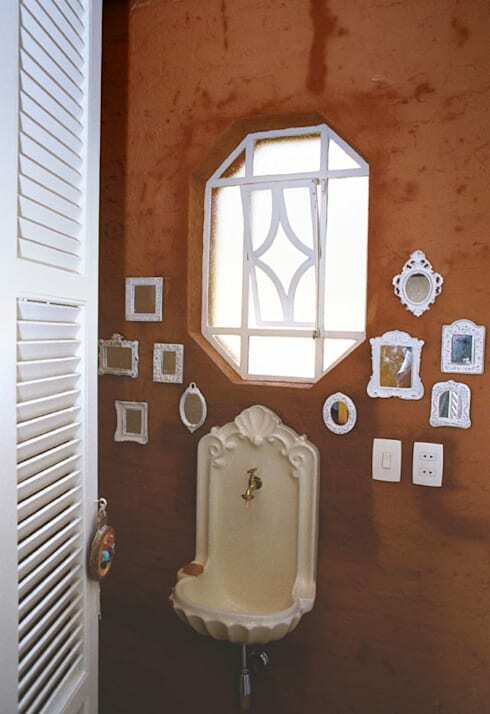 Add to that the gallery wall of tiny mirrors and you can tell that this home has a great sense of humour, as well as style! 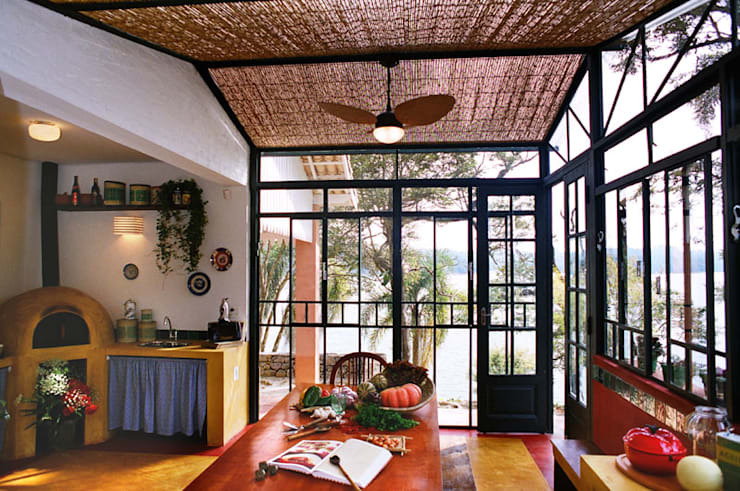 For more rustic home inspiration, take a look at this Ideabook: Rustic tips for modern homes. Would a rustic home like this one be perfection for you?